Edition 4 through 8 remain available. 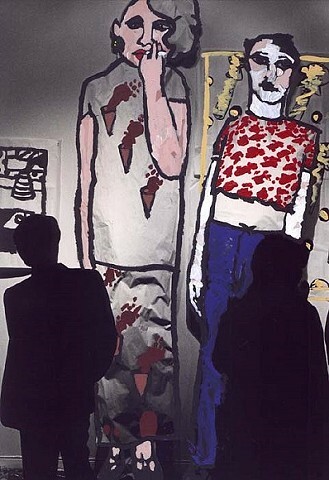 This exhibition, Gronk/Herron: Illegal Landscapes, by Los Angeles based artists and co-founders of the Los Angeles Art Collective, ASCO, Gronk and Willie Herron III, occurred in December 1980 on the campus of California State University Los Angeles. The opening reception also included a performance by Los Illegals. After I developed the film the man in this image reminded me of Adolph Hitler. I imagined that he and Eva had secretly escaped from Germany and settled into America under new identities. It would take Gronk, with his astute observation skills to discover and expose them. After the exhibition ended all of the artwork was torn down and thrown away, thus ending Adolph's and Eva's exile - or so it is believed. Looking at America today, just over 30 years later, I believe Adolph and Eva escaped the trash bin and remain at large, spewing their racist venom. Just listen to it coming out of the mouths of so many elected officials.